Energy efficient, lower power consumption without worrying about draining the batteries. The LED bulbs can last for more than 50,000 hours, many times longer than standard light bulb. Easy installation: 2-wire nuts and 4 mounting screws included, put screws into the provided hole to hold it in place. ORDER NOW! Stock is limited ! Click on the yellow "Add To Cart" button to get this awesome LED Double Dome Light ! [TIP] Looking for a WIN-WIN? More discounts purchased more than one item! (With On/Off switch) This LED fabric light fixture is new 12V lighting solution for interior decors! 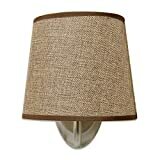 The elegant burlap hardback lampshade softens the light to provide comfortable illumination. There are different lampshades and colors for your choice. The RV lighting fixture needs to be vibration-proof for a moving vehicle. The solid holder made of coated steel is designed for a moving RV. Efficient heat dissipation ensures the stable performance and long lifespan. Providing 150 lumens illumination, the light consumes low power (0.24A, 3W) to save the energy. Surface wall mount design is for easy installation! For home application, please connect to a transformer with 12V DC output. You're buying NEW version. There's no candle decoration on the lamp any more. It's has more compact appearance than the old version ones. If you have any question about this, please contact seller Myrvaccessories directly. Fabric lampshade softens the light and provides even light distribution. Efficient heat dissipation insures long diode life. Surface mount design for easy installation. Classic design is suitable for most interior d¨¦cors. This vintage wall light can be used for home application when connects to a transformer with 12V DC output. Do not have to connect a separate switch, you can control the light easily by its On/Off switch. With vintage fabric shade, it is also a beautiful decoration. Adopting finest LEDs, this light has low power consumption to save energy. Fashionable Design & Compact One-Piece Structure Bring You An Ultra-Modern Outlook to Your Life. Does old-fashioned and frequently burn-down ball bulb light make you frustrated? Go on to try this new light. No more fumble in the darkness. You will find that this double dome light fixture a perfect replacement for the interior lighting in your car, RV, trailer, camper and boat. It arrives in one piece with LED panel wired in place. It has two wires without polarity. All you need to do is simply remove your old fixture and attach this new light with included nuts and screws to your existing wiring and socket, then the installation is completed. It also has power switch that allows one side or both sides on/off independently. That? ?s very convenient and energy-saving. It is CE and RoHs approved. 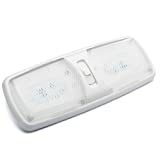 It features in high quality and environmentally plastic material and the finest LED lighting technology. Bright natural light output creates a cozy illuminated environment and make you feel at home. Energy efficiency and lower power consumption and no need to worry about draining the batteries. The LED bulbs can last for more than 60,000 hours, many times longer than standard light bulb. High Quality Material and Reliable Performance : this CE and RoHs approved double dome light has a life expectancy of more than 60,000 hours, lasts longer than standard bulb. It is also heat-resistant and anti-corrosive. Easy Installation: It has 2 two wires without polarity and comes with nuts and screws to hold it in place directly, suitable for smooth surface mounting. Convenient ON/OFF Switches Design: built-in 2-way switch that enables you to use one side or both sides of the light independently; it adds great functionality to any area for lighting and it is widely used as perfect replacement light for Car/RV/Trailer/Camper/Motorhomes/Marine Boats. Lower Power Consumption & High Energy Efficiency: It comes with two T10 Wedge panels with altogether 48 pcs 5050SMD LED Bulbs. It only draws 6 Watts and provides total 2 X 275 lumens of brightness. One Year Warranty GUARANTEE: We take full responsibility for our product and customer dissatisfaction. if there is any quality problem of our light or you are not happy with your purchase in our store, please kindly contact us and we are always ready to help. 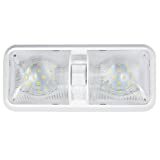 This CSA approved double pancake LED optic light is a great way to add functionality to any area in your RV. This light features a durable design and has a 3-Way switch. Lumitronics is the most trusted brand in aftermarket RV & trailer lighting. All products are designed in the USA with emphasis on durability and functionality. Lumitronics offers an extensive line of interior and exterior lighting fixtures and kits for RVs, campers, trailers, 5th wheels, toy haulers and more. Our comprehensive line of 12 volt replacement lights makes switching out your old lights easy. Lumitronics lighting offers a range of both LED lighting as well as traditional incandescent lights for all applications. SPECIFICATIONS: Total LED output of 505 Lumens - 6.2W, 12V - Size: 11.5" x 4.5" x 1.2"
Gold Stars LED replacement lights are built with the environment-friendly technology and materials. This Gold Stars LED features: 921 Base; 8-30 volts DC including 12v or 24v-this wide-range voltage is designed to withstand RV power fluctuations that can damage ordinary LED lights; 190 lumens; Natural white color; 2.53 Watts; 21 High power 5050 SMD LEDs; beam pattern 360 degrees; and color temperature of 4000-4500K. Each Gold Star LED bulb has a life expectancy of 60,000 hours-many times longer than a standard bulb-which saves money and time, especially in those hard-to-reach places. This product does not contain mercury or emit ultraviolet (UV) light. There are no moving parts or filaments, so it can withstand shaking and vibration. It's made with high quality SMDs (surface-mounted device) on aluminum base and weighs approximately 1 ounce. Replace your 1156 style auto back up light bulb with ease. Camco is committed to providing you a well designed bulb that has been developed with rigid adherence to product specifications. These bulbs operate on 12.8V and 2.1W while producing 32 candle power and will last approximately 1200 hours. Comes in a box of 10. 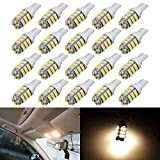 - Since LED bulbs have lower wattage comparing with the stock bulbs, you might need to add 50W 6-Ohm load resistors to prevent the LED bulbs from hyper flashing, malfunction or trigger warning message on dashboard. They are perfect for adding extra turn signal light, tail light, stop light, tail light, brake light, side marker and backup light, etc. Cross reference:1156 S25 BA15s 1073 1093 1129 1141 1159 1295 1459 1619 1651 1680 7506. SMD LEDs. Very bright! Up to 50K+ hours life time. - Latest tri-cell chips! Very bright! Up to 50K+ hours life time. - Easy installation, Direct plug in and play. 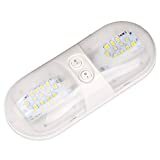 - These LED bulbs are longer and wider than stock T10 wedge light bulbs, therefore please make sure they will fit before buying. LEDs to remove Error Code. - Before you buy, Make sure the T10 Socket Type and the length of this bulb can fit in your car's lens of Housing. Package Included: Twenty Pieces of 12V T10 Wedge 42-SMD LED Bulbs. "Cross Reference: 921 912 906 168 192 W5W T10 T15 T10=168,194,921,2825,175,912,906,158,2827,2886X,922,161,904,904NA,906NA,912,916,916NA,917,920,158,160,161B,168A,168NA,192,193"
Application: High Mount Stop Light ,also use for Backup Reverse Lights, Interior (Map, Dome, Trunk...) License Plate Light, Parking Light, Corner Light, Side Marker Light, Tail Light, etc. Common use for Car, Truck, Motorcycle, Boat, RV, Trailer, etc. LED replacement bulbs are built with the finest LED lighting technology and materials. This EBA LED bulb has a 1156/1141 base and 4000-4500K Natural White. Each LED lasts many times longer than the standard bulb - saves time and money, especially in those hard-to-reach places. There are no moving parts or filaments, so it can withstand shaking and vibration. It's made with high-quality SMDs (Surface-mount devices) and weighs approximately 6 ounces. 12 Volt DC only. Applications include 12 Volt DC auto, marine, RV and military vehicles. RV power fluctuations can damage a regular LED light. Lasts much longer than a standard Lighting. Built with the finest LED lighting technology and materials. LED replacement bulbs are built with the finest LED lighting technology and materials. This EBA LED bulb has a 1156/1141 base; Applications include 12 Volt DC in auto, marine, RV, and military vehicles; 4000-4500K Natural White. Each LED lasts many times longer than the standard bulb - saves time and money, especially in those hard-to-reach places. There are no moving parts or filaments, so it can withstand shaking and vibration. It's made with high-quality SMDs (Surface-mount devices) and weighs approximately 6 ounces.